#C4NightmareCity – First Event of 2019! VIP and GA Tickets available NOW at VERTIGO RECORDS (193 Rideau Street, Ottawa). GA Tickets available at NOW Otherside Tattoo (561 Gladstone Ave.), The ODDs & SODs Shoppe (1527 Merivale Road), and St. Anthony's Hall (downstairs bar). #C4NightmareCity – Main Event Match signed! At the end of the night on November 16th, Matt Angel celebrated his career pinnacle-to-date moment, ending “Diamond Tiger” Kobe Durst’s year plus reign atop C*4, and became Champion. However, it was during this moment, where “Walking Weapon” Josh Alexander made his way to the ring, and challenged Angel to his Championship on January 25th. Angel did not take kindly to being interrupted on this night, at that moment – and let Alexander know it. The two brawled, and had to be separated by security. From June of 2012 until May of 2013, Josh Alexander held the C*4 Championship. He defended it against all comers. Since that time, the then “Ronin” Josh Alexander, has grown into a much different competitor. He’s been called the “Gatekeeper” of C*4. He has grown into the man that many people call the best wrestler in Canada… And now on January 25th, Josh Alexander gets his chance to reclaim that title he held so long ago. On January 25th, Matt Angel will defend his Championship for the first time… He will be out to prove he belongs on the top of the C*4 mountain. This will be a battle like no other. Matt Angel vs. Josh Alexander. Two of the nation’s best, for the Country’s top prize in independent wrestling. 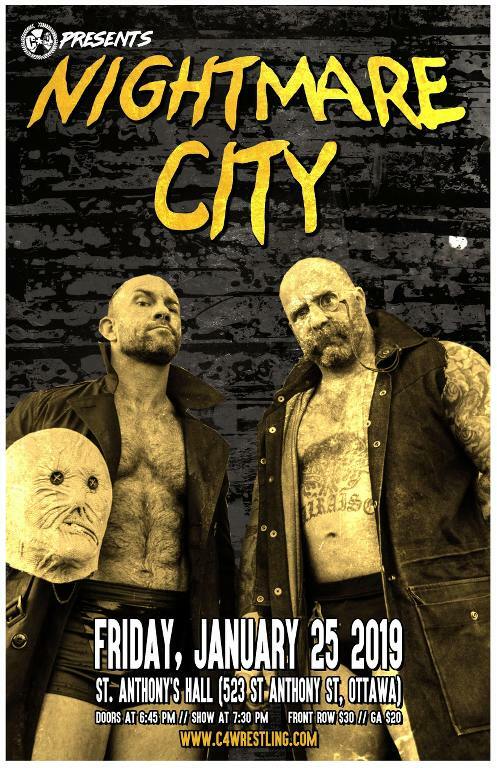 #C4NightmareCity – The Butcher and The Blade come to Ottawa! Last month, Tabarnak De Team seemed to get back to form as one of the most dominate tag teams in C*4 history, as they scored a win over The Fraternity in an absolutely WILD brawl. With the win, TDT made statement to the C*4 locker room, and fans, that they were back in their true form and ready for a fight. On January 25th, MSJ and Thomas Dubois will be stepping into the ring with one of their biggest challenges and unknowns they’ve ever faced. 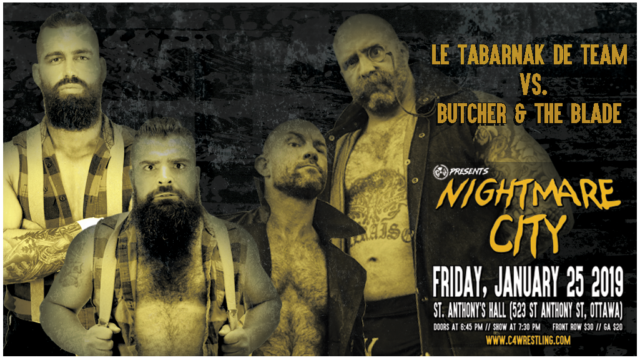 At #C4NightmareCity, TDT will step in the ring with The Butcher and The Blade! Made up of the veteran and all-around ring general, Pepper Parks, and his terrifying friend and protégé, Andy Williams of Everytime I Die Fame, The Butcher and The Blade are an imposing duo not to be taken lightly. Two teams who won’t back away from a challenge, or an all-out war. This is one you won’t want to miss! With the year quickly coming to an end, we’re excited to announce the next match for our first show of 2019. Today’s announcement features three talent’s who made their C*4 debut’s in 2018, and one who has been here since day one. Last month, in one of the hardest hitting battles ever to take place in C*4, Evil Uno narrowly overcame the rookie “Red Death” Daniel Garcia. Garcia shocked many in attendance to taking the fight hard to the violent veteran. However, in the end, Uno managed to beat his younger opponent. It was clear after this match, issues were far from over. On January 25th, the rivalry continues – this time adding in two more exciting young talents, who have been taking the independent scene by storm over the last twelve months. First up, making his second appearance in C*4 – one of the fastest rising talents in all of professional wrestling… Former CZW World Champion, and MLW Middleweight Champion, “MJF”, Maxwell Jacob Friedman. Next up, a man who has had hundreds of matches in his short career, and has made it clear that he is ready to climb the ladder in C*4, and everywhere else he competes. A man who has recently entered the ranks of EVOLVE Wrestling, and is positioning himself to be a major force across the independent landscape and beyond in 2019... Josh Briggs! This four-way match will be a possible show-stealer. Four men, all with something to prove. You do not want to miss this! 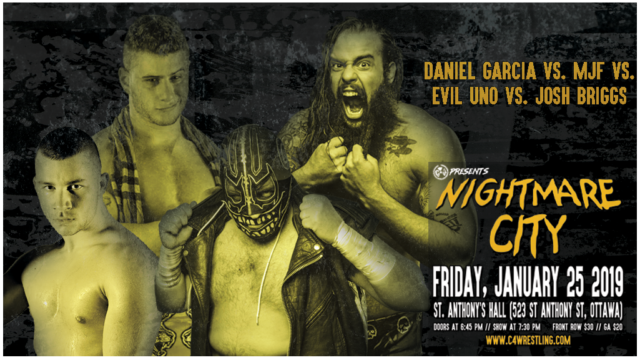 #C4NightmareCity – Huge first-time ever singles match signed! As we enter a new year, with the holiday season behind us, we are moving closer to our next huge show on January 25th! Already announced are three massive matches, including a huge Championship Main Event, an insane Tag Team match-up, and a star-studded four-way match. Well… We’ve got another massive match set for #C4NightmareCity! A collision between Canada’s best, against one of California’s top up-and-comers. 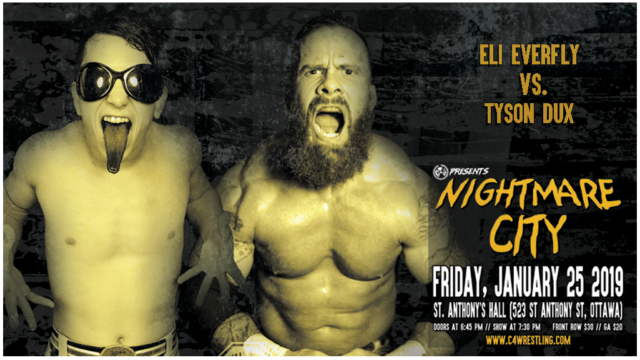 Eli Everfly returns and challenges Tyson Dux in a huge first-time-ever battle! 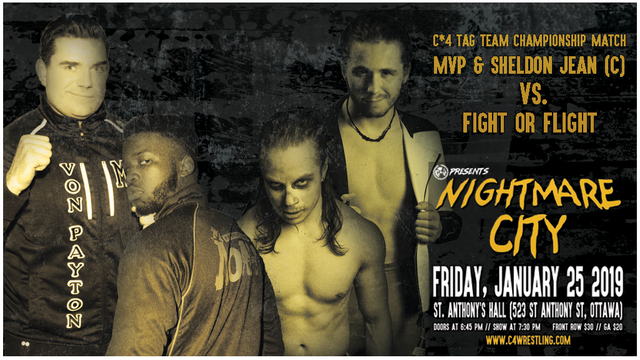 #C4NightmareCity – Tag Team Championship Re-Match! Garcia injury! Four-Way Dance! In just over two weeks, we have our next mega-show, #C4NightmareCity. We have a couple of announcements for January 25th, and an important injury update for one of the new standouts. First up, following the controversial win by “MVP” Michael Von Payton and Sheldon Jean, winning the C*4 Tag Team Championships against Gabriel Fuerza in a handicapped match. Fuerza was forced to defend the Championships on his own, as Vaughn Vertigo had to miss the show due to circumstances beyond his control. On January 25th, the sides will be even, as Fight Or Flight go to battle for the Championships they felt the never fairly lost. Over the last week, the independent wrestling community was rocked by the news of a car accident just outside of Buffalo, NY. The car accident left two talents severely injured – Kevin Blackwood, and Daniel Garcia. Garcia suffered two broken legs, and had to have emergency surgery. The time-table for his return to the ring is unknown sadly. He is very determined to return to the ring, and we look forward to seeing him back in C*4. As a result of Garcia’s accident, we have been forced to shuffle the card a little bit. With this in mind, we are excited to announce the following four-corner match! In November, Kobe Durst’s 14 month, C*4 Championship reign came to an end. During his time as Champion, Durst never backed down from a Challenger. A young man who went head on into battles with Mathieu St. Jacques, PCO, Teddy Hart, Joey Janela, and many others. On January 25th, Durst makes his first Post-Championship appearance…. And while he may not be a Champion any more, he’s not backing down from a challenge. Making his return to Ottawa, and his first appearance in C*4 this season… We’re pleased to welcome back the “Dirty Daddy” himself… Chris Dickinson! A win here for either man would certainly put them into the Championship hunt. #C4NightmareCity – Six Way Mayhem! A loaded scramble signed for next Friday night! In a week from today we will be presenting one of our biggest shows in history, as we present #C4NightmareCity. A debut, several returns, and some familiar faces, will all collide in a sure to be action-packed, potential show-stealer. 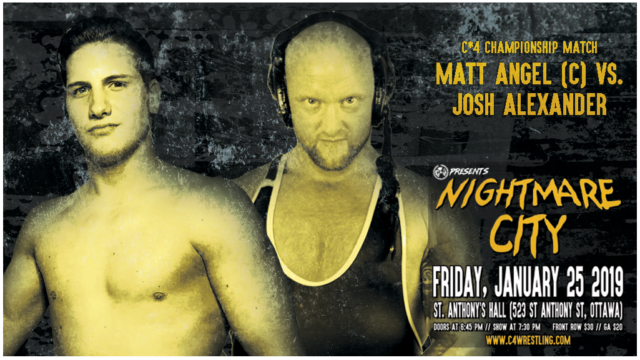 #C4NightmareCity – First-Time Ever Tag Team encounter! Full Card set! This Friday night we present one of our biggest shows ever, as we present #C4NightmareCity. This show is going to be incredible…. Get ready for a big night of action! First up, we have an incredible Tag Team match signed! C*4 Underground Champion, Benjamin Tull aligned himself with the returning Brad Alexis (formerly known as Velvet Jones), for form the MTL Elite. Putting the whole roster on notice the pair enters the tag team ranks this Friday night officially. MTL Elite will have their hands full when they step into the ring with Channing Decker and Trent Gibson, The Fraternity. Decker and Gibson won the entire audiences respect last month, as they went toe-to-toe with TDT in a wild Frat House Brawl. With the audience support behind them, The Frat go into battle this Friday. As always, the Card is Subject to change… And with that, we have one more slight change to make for January 25th’s show. Due to circumstances beyond our control, Stu Grayson will have to miss out on #C4NightmareCity. However, an exciting replacement has bee set! 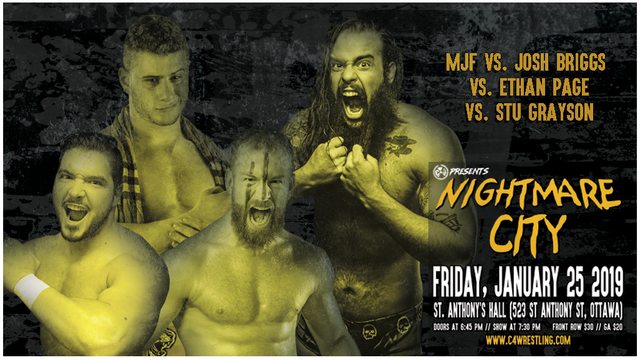 Returning to action this Friday night, the “Retro-Sexual” Anthony Greene enters the fray, competing against Ethan Page, MJF and Josh Briggs! Greene and Ethan Page tore it up last April at the final event at the VCC, and no doubt this encounter will be even better! All this and bonus Pre-Show action! Don’t miss out on this show! ALSO! If you arrive before doors open, starting at 5:30PM, the small hall will once again be open for food and drinks, and to warm up, ahead of venue doors opening! Arrive early, eat, drink, and have fun!